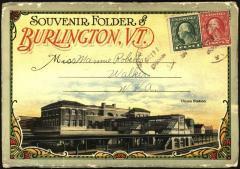 Souvenir folder containing 18 pull-out views of Fort Ethan Allen and Burlington area inside a mailing wrapper. Cover depicts Union Station in Burlington. Sent from William V. McGillian, of Company A, 31st Battalion to Mamie Roberts of Walker West Virginia on October 10, 1918. Message recounts that sender is stationed at Fort Ethan Allen and relates awareness of death of Charlie Curran.